Babies should be given weaning food at the end of the 4th month at the earliest and after the 6th month at the latest*. There are some babies aged 4 or 5 months that cannot satisfy their appetite with breast milk alone and need weaning food for healthy growth. Likewise, there are babies that thrive on breast milk alone until the end of 6 months, and are only ready for weaning food then. The decision to start weaning should always be made according to your child’s development. Is your baby not really full from breast milk or formula alone? Does your baby hold their head up straight unaided and show interest in new foods and the spoon? Then you can start with weaning food. If you are unsure, ask your paediatrician for advice. If your baby spits out the first spoons of pap, just be patient. She or he has to learn how to swallow. This is why you should only give your baby a small amount of spoonfuls of weaning food at the beginning, so your baby has enough time to get familiar with this new form of nutrition. *Recommendation by the Nutrition Committee of ESPGHAN (European Society for Pediatric Gastroenterology, Hepatology and Nutrition). Why is weaning food so important for your baby? After the 4th – 6th month, breast milk or milk formulae alone will no longer suffice to supply your baby with all the nutrients and energy he or she needs. Besides that, introducing more solid food will train the muscles around the mouth. And finally, by introducing weaning food, your baby will get to know a variety of different tastes, which is also important for your baby’s development. How should I start with weaning food? The individual milk meals throughout the day will be gradually replaced by weaning food over the coming weeks and months. We start with lunchtime, continue with the evenings and finally add the afternoons. In the morning, your baby will continue to get the usual milk meal. Ideally, you will start with 4 to 6 small spoonfuls of mashed vegetables at lunchtime (for example, with HiPP Pure Carrot, Pure Parsnip or Pumpkin). After that, your baby will get the usual milk feed or milk formula to feel full. You can increase the amount of vegetables by a few spoonfuls every day. Remain patient, even if your baby refuses to eat the vegetables at first. Try again over the next few days. After a few days you can alternately offer new kinds of vegetables (Pure Carrot, Pumpkin, Pure Parsnip). Broaden the menu after that with potatoes – with the baby jar of HiPP Baby Carrots with Potatoes, HiPP Parsnips with Potatoes or HiPP Pumpkin with Potatoes. If you want to, you can also introduce a meal in the evening, if it suits your daily rhythm better, or if Daddy maybe wants to take part in the first meal. If everything goes smoothly with vegetables, after about the 3rd week you can take the next step and feed a whole meal with meat. HiPP again has suitable products: menus with carrot, parsnip and pumpkin and other blends for tasty variation. As soon as your child eats about a whole jar with meat at lunchtime, you can leave out the midday breastfeeding or bottle. 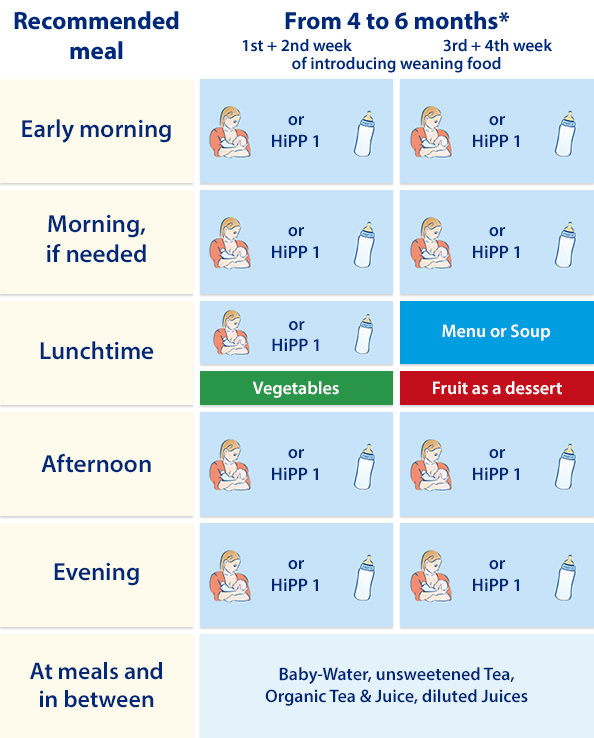 Individual meals: You can create individual menus by combining HiPP jars. Simply mix half a jar of vegetables (approx. 90 g) with half a jar of HiPP meat preparation (approx. 60 g). Dessert for baby? As a dessert we recommend a few spoonfuls of fruit rich in vitamin C. The vitamin C helps the absorption of valuable iron from the meat into the body. Tip: only heat up as much baby food as your baby is likely to eat. Keep the rest of the unheated food in the fridge and use it by the next day. Important! If you use a microwave: please remove the lid and cover the opening. Stir well after warming! In a microwave, food is warmed from the inside and the food could be unevenly warm. So-called heat nests could form. Only use a plastic spoon, so as not to damage the glass jar. Check the temperature before feeding.